of N.J.S.A. 2C:41-2c and N.J.S.A. 2C:41-2d, all as hereinafter described. 1. The predicate criminal activity occurred between in or about January 2005, and in or about April 2010. State of New York, in the Commonwealth of Pennsylvania, elsewhere, and within the jurisdiction of this Court. who is a co-conspirator and member of the enterprise, but not charged in this indictment, and other persons whose identities are both known and unknown to the State Grand Jurors, would constitute an enterprise within the meaning of N.J.S.A. 2C:41-1c, that is, a union or group of individuals associated in fact, or associates thereof, which, among other names, members or associates thereof self identified as the “Lucchese” organized crime family or the “Nine-Trey Gangster Bloods,” for the purposes set forth below. wireless telephones in fictitious or nominee names; prohibiting membership or association in the .enterprise to those who may have law enforcement familial relationships or familial relationships with those who may have cooperated with law enforcement. failure to pay gross income tax, and money laundering, all of which is the subject of Counts 4, 5, 6, 7, 8, 9, 10, 11, 12, 13, 14,15, 16, 17, 18, 33, and 34 of this Indictment, as well as other conduct. MATTHEW MADONNA did commit the racketeering conduct by engaging in and or conspiring to commit repeated acts of promoting gambling, possession of gambling records, theft by extortion, aggravated assault, possession of a weapon for an unlawful purpose, theft by deception, falsifying records, failure to file tax returns, failure to pay gross income tax, and money laundering, all of which is the subject of Counts 4, 5, 6, 7, 8, 9, 10, 11, 12, 13, 14, 15, 16, 17, 18, 33, and 34 of this Indictment, as well as other conduct. FRANK CETTA did commit the racketeering conduct by engaging ln and or conspiring to commit repeated acts of promoting gambling, possession of gambling records, theft by extortion, aggravated assault, possession of a weapon for an unlawful purpose, theft by deception, falsifying records, failure to file tax returns, failure to pay gross income tax, and money laundering, all of which is the subject of Counts 4, 5, 6, 7, 8, 9, 10, 11, 12, 13, 14, 15, 16, 17, 18, 33, and 34 of this Indictment, as well as other conduct. possession of gambling records, theft by extortion, aggravated assault, possession of a weapon for an unlawful purpose, theft by deception, falsifying records, failure to file tax returns, failure to pay gross income tax, and money laundering, all of which is the subject of Counts 4, 5, 6, 7, 8, 9, la, II, 12, 13, 14, 15, 16, 17, 18, 33, and 34 of this Indictment, as well as other conduct. RALPH M. PERNA did commit the racketeering conduct by engaging in and or conspiring to commit repeated acts of promoting gambling, possession of gambling records, theft by extortion, aggravated assault, possession of a weapon for an unlawful purpose, theft by deception, falsifying records, failure to file tax returns, failure to pay gross income tax, and money laundering, all of which is the subject of Counts 4, 5, 6, 7, 8, 9, la, 11, 12, 13, 14, 15, 16, ‘ 17, 18, 33, and 34 of this Indictment, as well as other conduct. all of which is the subject of Counts 4, 5, 6, 7, 8, 9, 10, II, 12, 13, 14, 15, 16, 17, 18, 33, and 34 of this Indictment, as well as other conduct. GARY MEDURE did commit the racketeering conduct by engaging in and or conspiring to commit repeated acts of promoting gambling, possession of gambling records, theft by extortion, aggravated assault, possession of a weapon for an unlawful purpose, theft by deception, falsifying records, failure to file tax returns, failure to pay gross income tax, and money laundering, all of which is the subject of Counts 4, 5, 6, 7, 8, 9, 10, 11, 12, 13, 14, 15, 16, 17, 18, 33, and 34 of this Indictment, as well as other conduct. ELLIOT PORCO did commit the racketeering conduct by engaging in and or conspiring to commit repeated acts of promoting gambling, possession of gambling records, theft by extortion, aggravated assault, possession of a weapon for an unlawful purpose, theft by deception, falsifying records, failure to file tax returns, failure to pay gross income tax, and money laundering, all of which is the subject of Counts 4, 5, 6, 7, 8, 9, 10, 11, 12, 13, 14, 15, 16, 17, 18, 33, and 34 of this Indictment, as well as other conduct. did commit the racketeering conduct by engaging in and or conspiring to commit repeated acts of promoting gambling, possession of gambling records, theft by extortion, aggravated assault, possession of a weapon for an unlawful purpose, theft by deception, falsifying records, failure to file tax returns, failure to pay gross income tax, and money laundering, all of which is the subject of Counts 4, 5, 6, 7, 8, 9, la, II, 12, 13, 14, IS, 16, 17, 18, 33, and 34 of this Indictment, as well as other conduct. assault, possession of a weapon for an unlawful purpose, theft by deception, falsifying records, failure to file tax returns, failure to pay gross income tax, and money laundering, all of which is the subject of Counts 4, 5, 6, 7, 8, 9, 10, 11, 12, 13, 14, 15, 16, 17, 18, 33, and 34 of this Indictment, as well as other conduct. MICHAEL RAMUNO III did commit the racketeering conduct by engaging in and or conspiring to commit repeated acts of promoting gambling, possession of gambling records, theft by extortion, aggravated assault, possession of a weapon for an unlawful purpose; theft by deception, falsifying records, failure to file tax returns, failure to pay gross income tax, and money laundering, all of which is the subject of Counts 4, 5, 6, 7, 8, 9, 10, 11, 12, 13, 14, 15, 16, 17, 18, 33, and 34 of this Indictment, as well as other conduct. 12, 13, 14, 15, 16, 17, 18, 33, and 34 of this Indictment, as well as other conduct. GIANNI IACOVO did commit the racketeering conduct by engaging in and or conspiring to commit repeated acts of promoting gambling, possession of gambling records, theft by extortion, aggravated assault, possession of a weapon for an unlawful purpose, theft by deception, falsifying records, failure to file tax returns, failure to pay gross income tax, and money laundering, all of which is the subject of Counts 4, 5, 6, 7, 8, 9, 10, 11, 12, 13, 14, 15, 16, 17, 18, 33, and 34 of this Indictment, as well as other conduct. did commit the racketeering conduct by engaging in and or conspiring to commit repeated acts of promoting gambling, possession of gambling records, theft by extortion, aggravated assault, possession of a weapon for an unlawful purpose, theft by deception, falsifying records, failure to file tax returns, failure to pay gross income tax, and money laundering, all of which is the subject of Counts 4, 5, 6, 7, 8, 9, 10, II, 12, 13, 14, IS, 16, 17, 18, 33, an.d 34 of this Indictment, as well as other conduct. JAMES FURFARO did commit the racketeering conduct by engaging in and or conspiring to commit repeated acts of promoting gambling, possession of gambling records, theft by extortion, aggravated assault, possession of a weapon for an unlawful purpose, theft by deception, falsifying records, failure to file tax returns, failure to pay gross income tax, and money laundering, all of which is the subject of Counts 4, 5, 6, 7, 8, 9, 10, II, 12, 13, 14, IS, 16, 17, 18, 33, and 34 of this Indictment, as well as other conduct. assault, possession of a weapon for an unlawful purpose, theft by deception, falsifying records, failure to file tax returns, failure to pay gross income tax, and money laundering, all of which is the subject of Counts 4, 5, 6, 7, S, 9, la, 11, 12, 13, 14, 15, 16, 17, lS, 33, and 34 of this Indictment, as well as other conduct. JOHN TURI did commit the racketeering conduct by engaging in and or conspiring to commit repeated acts of promoting gambling, possession of gambling records, theft by extortion, aggravated assault, possession of a weapon for an unlawful purpose,theft by deception, falsifying records, failure to file tax returns, failure to pay gross income tax, and money laundering, all of which is the subject of Counts 4, 5, 6, 7, S, 9, la, 11, 12, 13, 14, 15, 16, 17, lS, 33, and 34 of this Indictment, as well as other conduct. GEORGE MAIORANO did commit the racketeering conduct by engaging in and or conspiring to commit repeated acts of promoting gambling, possession of gambling records, theft by extortion, aggravated assault, possession of a weapon for an unlawfUl purpose, theft by deception, falsifying records, failure to file tqX returns, failure to pay gross income tax, and money laundering, all of which is the subject of Counts 4, 5, 6, 7, 8, 9, 10, 11, 12, 13, 14, 15, 16, 17, 18, 33, and 34 of this Indictment, as well as other conduct. BLERIM IBRIAMI did commit the racketeering conduct by engaging in and or conspiring to commit repeated acts of promoting gambling, possession of gambling records, theft by extortion, aggravated assault, possession of a weapon for an unlawful purpose, theft by deception, falsifying records, failure to file tax returns, failure to pay gross income tax, and money laundering, all of which is the subject of Counts 4, 5, 6, 7, 8, 9, 10, 11, 12, 13, 14, 15, 16, 17, 18, 33, and 34 of this Indictment, as well as other conduct. ROSANNA PERNA did commit the racketeering conduct by engaging in and or conspiring to commit repeated acts of promoting gambling, possession of gambling records, theft by extortion, aggravated assault, possession of a weapon for an unlawful purpose, theft by deception, falsifying records, failure to file tax returns, failure to pay gross income tax, and money laundering, all of which is the subject of Counts 4, 5, 6, 7, 8, 9, la, II, 12, 13, 14, IS, 16, 17, 18, 33, and 34 of this Indictment, as well as other conduct. as well as other conduct. SAMUEL A. JULIANO did commit the racketeering conduct by engaging in and or conspiring to commit repeated acts of distribution of controlled dangerous substance, bribery, possession with the intent to distribute a controlled dangerous substance, unlawful use of firearms, unlawful possession of destructive devices or explosives, and money laundering, all of which is the subject of Counts 19, 21, 23, 24, 26, 27, 28, 30, 31, 32, 33, and 34 of this Indictment, as well as other conduct. All in violation of N.J.S.A. 2C:41-2c, N.J.S.A. 2C:41-2d, and against the peace of this State, the government and dignity of the same. 3. The said interests, all subject to forfeiture to the State of New Jersey, shall expressly include all items of real and personal property detailed within the attached “Appendix A” to this indictment which are incorporated herein as if set forth in full. N.J.S.A. 2C:5-2g. and N.J.S.A. 2C:2-6, and against the peace of this State, the government and dignity of the same. 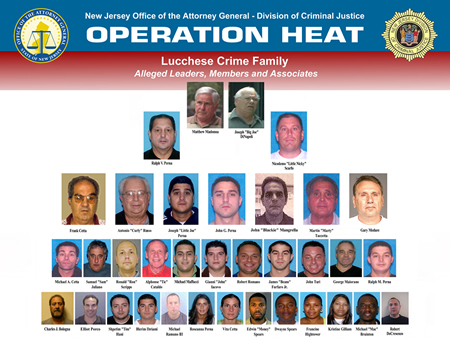 to the Grand Jurors, who compromised an illegal enterprise of individuals associated in fact, which referred to itself as the Lucchese organized crime family, as an organizer, supervisor, and manger, to commit a continuing series of crimes which would constitute a pattern or racketeering activity, pursuant to the provisions of N.J.S.A. 2C:41-1a and d, all of which is described in Count One of this Indictment and incorporated herein by reference, contrary to the provisions of N.J.S.A. 2C:5-2g, and against the peace of this State, the government and dignity of the same. person other than a player whose chances or plays are represented by such money or records, or more than $100 in anyone day of money played in such illegal lottery, policy scheme or enterprise, contrary to the provisions of N.J.S.A. 2C:37-2a(1), N.J.S.A. 2C:37-2a(2), N.J.S.A. 2C:37-2b(1), and 2C:37-2b(2) . 1. Knowingly, with knowledge of the contents thereof, to possess a writing, paper, instrument or article of a kind commonly used in the operation or promotion of a bookmaking scheme or enterprise, constituting, reflecting or representing more than five bets totaling more than $1000, or of a kind commonly used in the operation, promotion or playing of a lottery or a policy scheme or enterprise, which constitute, reflect, or represent more than 100 plays or chances therein, contrary to the provisions of N.J.S.A. 2C:37-3a(1) and N.J.S.A. 2C:37-3a(2). 2. Purposely to obtain by extortion property of another, that is, u.s. currency, by purposely threatening to inflict bodily injury on, physically confine or restrain anyone or commit any other criminal offense, contrary to the provisions of N.J.S.A. 2C:20-5. 3. Purposely to attempt to cause serious bodily injury to another, contrary to the provisions of N.J.S.A. 2C:12.,.lb(1) . 4. To possess a certain weapon, that is, a knife, with the purpose to use it unlawfully against the person or property of another, contrary to the provisions of N.J.S.A. 2C:39-4d. 5. Purposely to obtain the property of another having a value of $75,000 or more, by deception, contrary to the provisions of N.J.S.A. 2C:20-4. 6. With purpose to deceive or injure another or to conceal a wrongdoing, to falsify or utter a writing or record knowing it to contain a false statement or information, contrary to the provisions of N.J.S.A. 2C:21~4a. [R.S. 54:48-1 et seq], to fail to file a tax return as required to be filed pursuant to the provisions of the State Tax Uniform Procedure law [R.S. 54:48-1 et seq], contrary to the provisions of N.J.S.A. 54:52-8. All in violation of N.J.S.A. 2C:5-2, and against the peace of this State, the government and dignity of the same. phases, or toward any other phase of its operation, .by engaging in bookmaking and receiving or accepting in anyone day more than five bets totaling more than $1000, or by receiving, in connection with an illegal lottery, policy scheme or enterprise, money or written records from a person other than a player whose chances or plays are represented by such money or records, ·or more than $100 in anyone day of money played in such illegal lottery, policy scheme or enterprise, contrary to the provisions of N.J.S.A. 2C:37-2a(1), N.J.S.A. 2C:37-2a(2), N.J.S.A. 2C:37­2b(1), 2C:37-2b(2), and N.J.S.A. 2C:2-6, and against the peace of this State, the government and dignity fo the same. provisions of N.J.S.A. 2C:37-3a(1), 2C:37-3a(2) and N.J.S.A. 2C:2-6, and against the peace of this State, the government and dignity of the same. N.J.S.A. 2C:20-5 , N.J.S.A. 2C:5 -1 and N.J.S.A. 2C:2-6, and against the peace of this State, the government and dignity of the same. to the provisions of N.J.S.A. 2C:12-1b(l), N.J.S.A. 2C:2-6, and against the peace of this State, the government and dignity of the same. N.J.S.A. 2C:2-6, and against the peace of this State, the government and dignity of the same. N.J.S.A. 2C:2-6, and against the peace of this State, th~ government and dignity of the same. contrary to the provisions of N.J.S.A. 2C:20-4 and N.J.S.A. 2C:2-6/ and against the peace of this State/ the government and dignity of the same. mortgage loan 73825289, attesting that the said JOSEPH M. PERNA and ROSANNA PERNA had specific e,mployment and lawful income in support of said loan, contrary to the provisions of N.J.S.A. 2C:21-4a and N.J.S.A. 2C:2-6, and against the peace of this State, the government and dignity of the same.
.	54:48-1 et seg) / contrary to the provisions of N.J.S.A. 54:52-8 and N.J.S.A. 2C:2-6, and against the peace of this State/ the government and dignity of the same. ROSANNA PERNA between in or about January 2005, and in or about April 2010, at the Borough of Franklin Lakes, at the Borough of Glen Rock, and at the Borough of River Edge, all in the County of Bergen, at the Borough of North Haledon, in the County of Passaic, at the City of Trenton, in the County of Mercer, elsewhere, and within the jurisdiction of this Court, with intent to evade, avoid or otherwise not make timely payment of the tax required to be paid pursuant to N.J.S.A 54:48-1 et seg., for the calendar years ending 2005, 2006 and 2007, did fail to pay and turn over the gross income taxes due, contrary to the provisions of N.J.S.A. 54:52-9 and N.J.S.A. 2C:2-6, and against the peace of this State, the government and dignity of the same. RALPH M. PERNA between in or about January 2005, and in or about April 2010, at the Township of West Caldwell, in the County of Essex, _at the City of Trenton, in the County of Mercer, elsewhere, and within the jurisdiction of this Court, with intent to evade, avoid or otherwise not make timely payment of the tax required to be paid pursuant to N.J . S.A 54:48-1 et seq., for the calendar years ending 2005, 2006 and 2007, did fail to pay and turn over the gross income taxes due, contrary to the provisions of N.J.S.A. 54:52 -9, and against the peace of this State, the government and dignity of the same . [R.S. 54:48-1 et seq], did fail to file a tax return for the calendar year ending 2007, as required to be filed pursuant to the provisions of the State Tax Uniform Procedure law [R.S. 54:48-1 et seq], contrary to the provisions of N.J.S.A. 54:52-8 and N.J.S.A. 2C:2-6, and against the peace of this State, the government and dignity of the same. VITA CETTA between in or about January 2005, and in or about April 2010, at the Township of Wyckoff, in the County of Bergen, at the City of Trenton, in the County of Mercer, elsewhere, and within the jurisdiction of this Court, with intent to evade, avoid or otherwise not make timely payment of the tax required to be paid pursuant to N.J.S.A 54:48-1 et seq., for the calendar years ending 2005, 2006 and 2007, did fail to pay and turn over the gross income taxes due, contrary to the provisions of N.J.S.A. 54:52-9 and N.J.S.A. 2C:2-6, and against the peace of this State, the government and dignity of the same. 1. Knowingly, in the capacity of a public servant, to commit an unauthorized act relating to said public office with purpose to obtain a benefit for themselves or another, or knowingly to refrain from performing a duty imposed by law or which clearly inherent in the nature of said public office, contrary to the provisions of N.J.S.A. 2C:30-2.
violation of an official duty of a public servant, contrary to the provisions of N.J.S.A. 2C:27-2. 4. Knowingly to possess an electronic communication device, that is, a wireless telephone, while confined in a State correctional facility, contrary to the provisions of N.J.S.A. 2C:29-10(b) . All in violation of N.J.S.A. 2C:5-2, and against the peace of this State, the government and dignity of the same. SPEARS, arid KRISTEN GILLIAM, knowingly did, directly or indirectly, offer, confer, or agree to confer upon the said MICHAEL BRUINTON, a public servant in his capacity as a sworn law enforcement officer with the New Jersey Department of Corrections, who knowingly did directly or indirectly solicit, accept, or agree to accept a benefit having a value in excess of $200, as consideration for the violation of an official duty of the public servant, contrary to the provisions of N.J.S.A. 2C:27-2(c) and N.J.S.A. 2C:2-6, and against the peace of this State, the government and dignity of the same. SAMUEL A. JULIANO on or about December 6, 2007, at the Borough of Glen Ridge, in the County of Essex, elsewhere, and within the jurisdiction of this Court, knowingly or purposely did possess with intent to distribute a controlled dangerous substance, that is, Oxycodone, a Schedule II Narcotic Drug, in a quantity of one ounce or more including any adulterants or dilutants, contrary to the provisions of N.J.S.A. 2C:35-5(a) (1) and N.J.S.A. 2C:35-5(b) (4), and against the peace of this State, the government and dignity of the same. SAMUEL A. JULIANO on or about December 6, 2007, at the Borough of Glen Ridge, in the County of Essex, elsewhere, and within the jurisdiction of this Court, knowingly or purposely did possess with intent to distribute a controlled dangerous substance, that is, cocaine, in an aggregate quantity of one-half ounce or more including any adulterants or dilutants, contrary to the provisions of N.J.S.A. 2C:35-5a(1), N.J.S.A. 2C:35-5b(2) and N.J.S.A. 2C:35-5c, and against the peace of this State, the government and dignity of the same. SAMUEL A. JULIANO on or about December 6, 2007, at the Borough of Glen Ridge, in the County of Essex, elsewhere, and within the jurisdiction of this Court, knowingly or purposely did possess controlled dangerous substances, that is, cocaine and Oxycodone, both Schedule II controlled dangerous substances, contrary to the provisions of N.J.S.A. 2C:35-10a(1), and against the peace of this State, the government and dignity of the same. Amadeo Rossi & CIA hand gun, serial number 2175, one double barrel Ithaca shotgun, serial number 194523, and one .22 single shot Winchester rifle, model number 60, contrary to the provisions of N.J.S.A. 2C:39-7b, and against the peace of this State, the government and dignity of the same. N.J.S.A. 2C:39-5b, and against the peace of this State, the government and dignity of the same. N.J.S.A. 2C:39-5c, and against the peace of this State, the government and dignity of the same. SAMUEL A. JULIANO on or about December 6, 2007, at the Borough of Glen Ridge, in the County of Essex, elsewhere, and within the jurisdiction of this Court, knowingly did possess a destructive device, that is, one incendiary bomb or military grenade, contrary to the provisions of N.J.S.A. 2C:39-3a, and against the peace of this State, the government and dignity of same. of N.J.S.A. 2C:39-4.1(a), and against the peace of this State, the government and dignity of the same. N.J.S.A. 2C:39-3d, and against the peace of this State, the government and dignity of same. SAMUEL A. JULIANO on or about December 6, 2007, at the Borough of Glen Ridge, in the County of Essex, elsewhere, and within the jurisdiction of this Court, knowingly did possess dum dum bullets, that is, one box of fifty, .357 Magnum 110 GR jacketed hollow point bullets, contrary to the provisions of N.J.S.A. 2C:39-3f, and against the peace of this State, the government and dignity of same. in whole or in part to conceal or disguise the nature, location, source, ownership or control of said property, or knowingly direct, organize, finance, plan, manage, supervise, or control the transportation of or the transactions in property known or which a reasonable person would believe to be derived from criminal activity, said property having a value of $500,000 or more, contrary to the provisions of N.J.S.A. 2C:21~25. in said property was of property known, or which a reasonable person would believe, to be derived from criminal activity, cohtrary to the provisions of N.J.S.A. 2C:21-25a and N.J.S.A. 2C:21~25b and N.J.S.A. 2C:2-6, and against the peace of this State, the government and dignity of the same. forfeitures pursuant to N.J.S.A. 2C:41-3b. IT IS ORDERED on this I~t1\ day of fV) ~ ,2010, pursuant to paragraph 8 of the State Grand Jury Act, that t~e County of Morris be and hereby is designated as the County of Venue for the purpose of trial. IT IS FURTHER ORDERED that the Clerk of the Superior Court shall transmit forthwith the Indictment in this matter and a certified copy of this Order to the Criminal Division Manager of the County of Morris for filing.